Former world number one Ding Junhui came through the final round of World Championship qualifying and says he is the player seeds will want to avoid in Thursday's main draw. 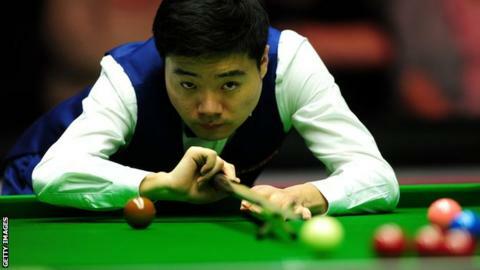 The 29-year-old Chinese thrashed 1995 Crucible runner-up Nigel Bond 10-2 on Wednesday. Former world semi-finalist Ding was required to qualify at Pond's Forge after his ranking dropped to 17. "It doesn't matter who I play," he said. "They don't want to play me." Ding lost only seven frames across his three qualifying matches and will pose a serious threat when paired with a top-16 player in the first round of the tournament, which starts on Saturday. Also through to the main draw are 2002 champion Peter Ebdon, 2006 winner Graeme Dott, two-time finalist Ali Carter and Crucible veteran Alan McManus, who will be making his 20th appearance in Sheffield. Notable casualties of the final qualifying round were 1997 champion Ken Doherty, beaten 10-6 by Ryan Day, and twice-finalist Matthew Stevens, likewise losing 10-6, to Kyren Wilson.